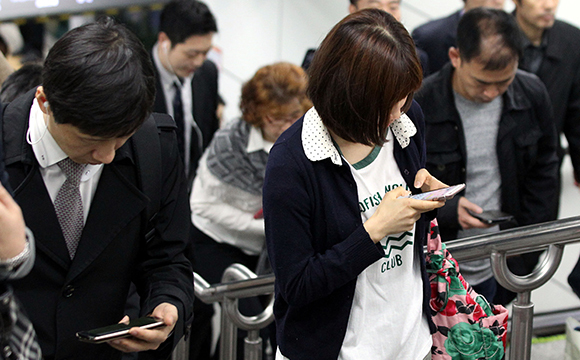 Smartphones have become the most dominant medium to search for necessary information for everyday life in South Korea that ranks No. 1 worldwide in terms of smartphone ownership, showed a government survey on Thursday. According to the result of a survey conducted on 7,234 people across the country aged over 13 from June 4 to August 10 by Korea Communications Commission, 57.2 percent of the respondents answered smartphones are the medium they rely the most in daily life, and 64.6 percent said they are the most effective medium to assess to necessary information during disaster. The survey asked the respondents about types of the media they own, the amount of time spent on each device and usage pattern, importance of the media in everyday life, and online video content usage. Respondents in their teens to 40s said smartphones are the most essential device in their daily lives and upon disaster outbreak, while those in their 50s picked television. The survey, however, showed that respondents spent the most time to watch TV – 2 hours and 47 minutes on average every day, followed by smartphones (1 hour and 36 minutes), and radio (14 minutes). The latest survey result was not a surprise after smartphone penetration rate in Korea increased from 87.1 percent in 2017 to 89.4 percent last year. The rate, in particular, jumped from 60.3 percent in 2016 to 73.6 percent in 2017 and 80.3 percent last year among Koreans in their 60s, leaving well-aged people also on high influence of smartphones.